For those who don’t like their cakes too sweet, but still love them full of flavour, then this one is definitely for you! As it contains corn meal/polenta instead of flour, it’s also gluten free (ensure you use gluten free baking powder in this instance). I glazed mine with an orange and Amaretto syrup. This is an incredibly easy cake to make and can be prepared quickly and easily using a food processor. I have a Kenwood MultiPro Sense food processor which also has a weighing scale built in, so this really is an easy, one bowl wonder of a cake to make! Wash any wax coating off the oranges. Place the oranges into a large saucepan and cover with cold water. Bring to the boil, cover and reduce to a simmer. Simmer for 1 hour until the oranges have softened. Remove the oranges from the water and set aside to cool. Grease and line a 23cm/9″ springform cake tin. Cut the oranges into ¼ and remove the pips. Place the oranges (skin, pith and pulp) into a food processor with the sugar and blitz into a smooth paste. Add the almonds, corn meal/polenta, eggs, baking powder, ginger and cinnamon. Pour the cake batter into your prepared tin. Bake for 60 minutes, until cooked in the centre. Cool the cake in the tin. Remove the cake from the tin when cold and place it on to a plate. 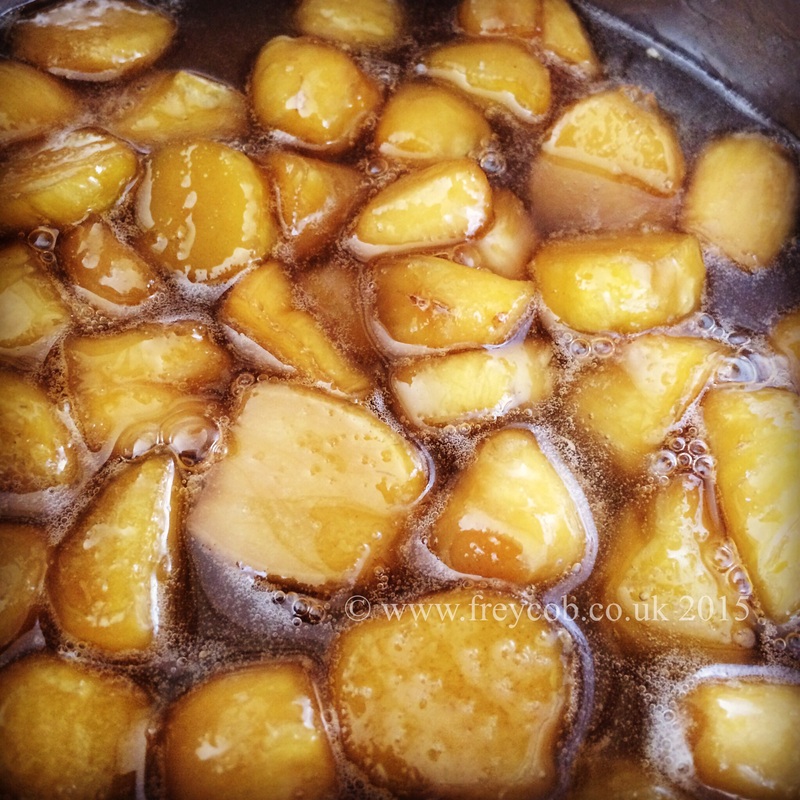 For the glaze, add the sugar and water into a saucepan and heat gently, bringing it to the boil without stirring until the sugar has dissolved and the syrup has turned a golden brown. Add the orange juice, orange zest and amaretto and stir to fully combine. Bring back to the boil and boil gently until the syrup has reduced and become thickened. Poke small holes in the top of the cake to allow the syrup to soak through. Pour the syrup over the cake evenly and gently, allowing it to soak in. Serve the cake warm or cold with some clotted cream, ice cream, or cream. This recipe was neither sponsored, or endorsed by Kenwood, Gaya Foods or by Tesco. Such a simple but deliciously easy dish to prepare using a well stocked store cupboard’s ingredients is my lamb keema recipe. When I worked for an accountancy practice, one of the clients I used to go out and visit would often feed me some of this for lunch that his wife had made. Bear in mind that they had two young girls who ate this – it would have me almost in tears with the heat – I’m such a wimp! Be assured that mine is nowhere near as hot as that, but it can be if you want it to! Add the cumin seeds and bay leaves and fry off for 30 seconds. Add the onion and cook until starting to brown. This should take 3-4 mins. Add the chopped chillies and the tomatoes. Stir through thoroughly and cook for 1 minute. Add the ginger and garlic paste, the turmeric, chilli powder, garam masala and mince. Stir, breaking the mince down to separate it. Add ¼ tsp salt and the cup of water, along with the frozen peas and stir thoroughly. Simmer for 20 minutes until cooked and the liquid has reduced by two thirds. Chop the mint and coriander finely. Add the herbs to the keema, mix together and cook for 1 minute. Remove and discard the bay leaves. Mix the natural yoghurt with the mint sauce concentrate. Serve the keema with a spoonful of the minted natural yoghurt, along with a naan bread. The ingredients aren’t set in stone for this one; add or remove ingredients that you do or don’t like. (I personally don’t like mushrooms, but he does, so they went in and I picked them out of my dinner). The Mange Tout came from our garden, the French beans were reduced in price in our local supermarket as they had to be sold on the day, as was the courgette. All other ingredients we had at home as staples in our cupboards/fridge. It looks like a lot of ingredients, I know! Sweet potato and Jersey Royals. French beans and mange tout. 2. In a large saucepan/frying pan with a lid, heat the oil and add your mustard seeds, cumin seeds, fennel seeds, fenugreek seeds and cardamon pods. Cook for 2-3 minutes to allow the flavours to infuse the oil. The seeds may start to pop as they cook, don’t worry, this is normal. 3. Add the celery and the carrots, stir to coat evenly in the spiced oil and cook on a medium heat for 2-3 minutes. 4. Add the ginger, garlic and salt and coat evenly. Cook gently for 4-5 minutes. 5. Add the sweet potato and the Jersey Royals, stir thoroughly and cook for 2-3 minutes. If the vegetables start to stick to the pan, add a splash of water to loosen the mixture. 6. Add the chilli powder, turmeric, cumin powder and coriander powder, stir and cook for 2-3 minutes. 7. Add the fresh chilli and stir thoroughly. Cook for 1-2 minutes. 8. Add the French beans, mange tout and stir. Place the lid on the pan and simmer for 5 minutes. 9. Add the frozen peas and diced courgettes. Cook for 2-3 minutes. 10. Stir in the mushrooms. Place the lid on the pan and cook for 5 minutes. 11. Add the coconut milk, bring to a gentle boil, then reduce the heat to a simmer, put the lid on and simmer for 10-12 minutes until the vegetables are all cooked. 12. Finally stir through the chopped coriander and serve with boiled rice. He cooked this on his little camping stove in the garden to tease the neighbours I think with the delicious smells, but we didn’t invite them to share the meal with us! HAHA! 1. Peel your ginger. The best way to do this in with the bowl of a teaspoon, rather than a knife as then it only takes off the outer paper and doesn’t cut into and waste your ginger flesh. 2. Cut the peeled ginger into evenly sized slices, approximately 1cm thick. 3. 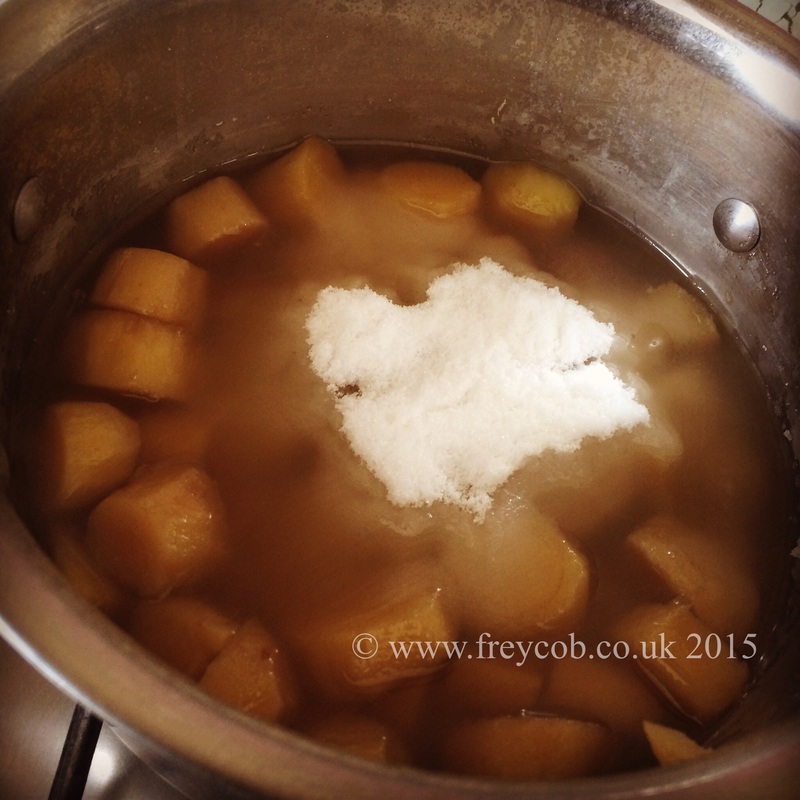 Weigh the peeled ginger, then weigh out an identical weight of caster sugar, and set your sugar aside for use later. 4. 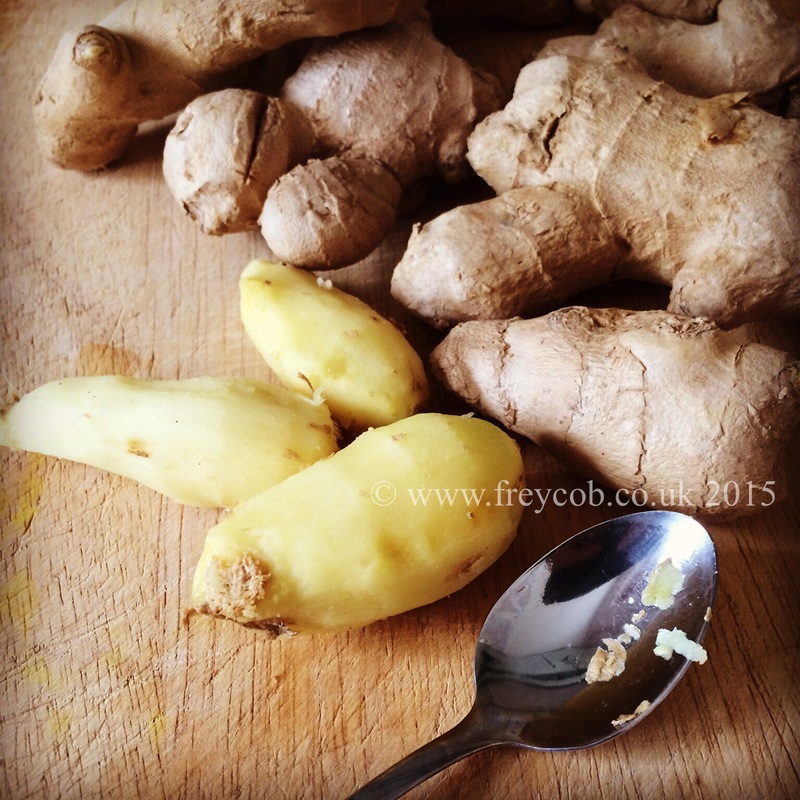 Place the ginger pieces into your heavy bottomed saucepan. My Le Creuset pans are perfect for this. 5. Cover with cold water until the ginger is just submerged and bring to the boil. 6. Add the lid to the pan and reduce the heat to a simmer. 7. 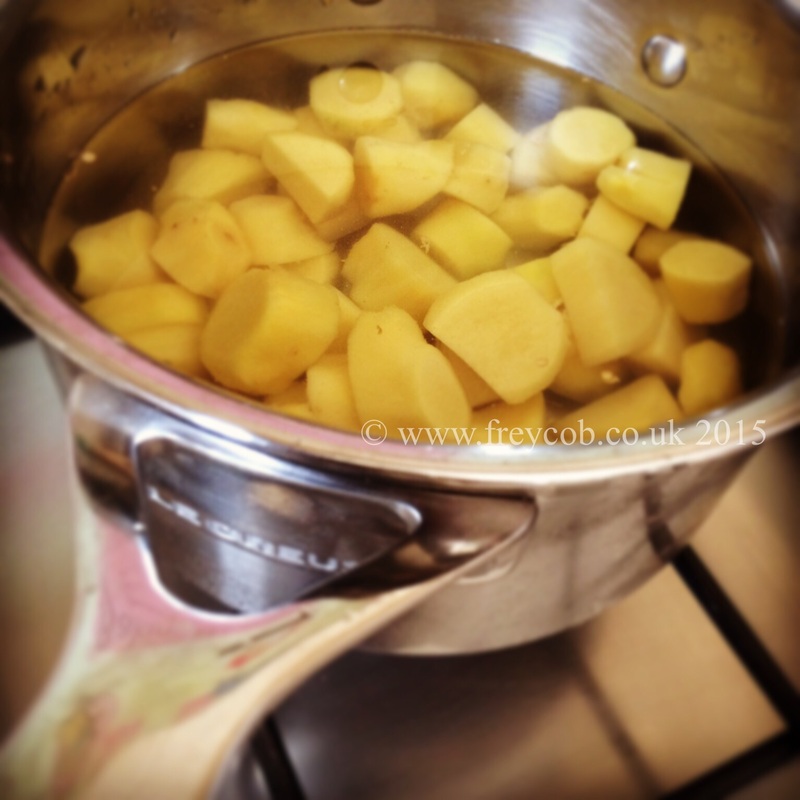 Simmer for an hour, or until your ginger is tender when tested with the tip of a knife. If your water is getting low, then top it up with a bit of boiling water from the kettle. 8. When your ginger is tender, pour in your sugar and bring to the boil. 9. 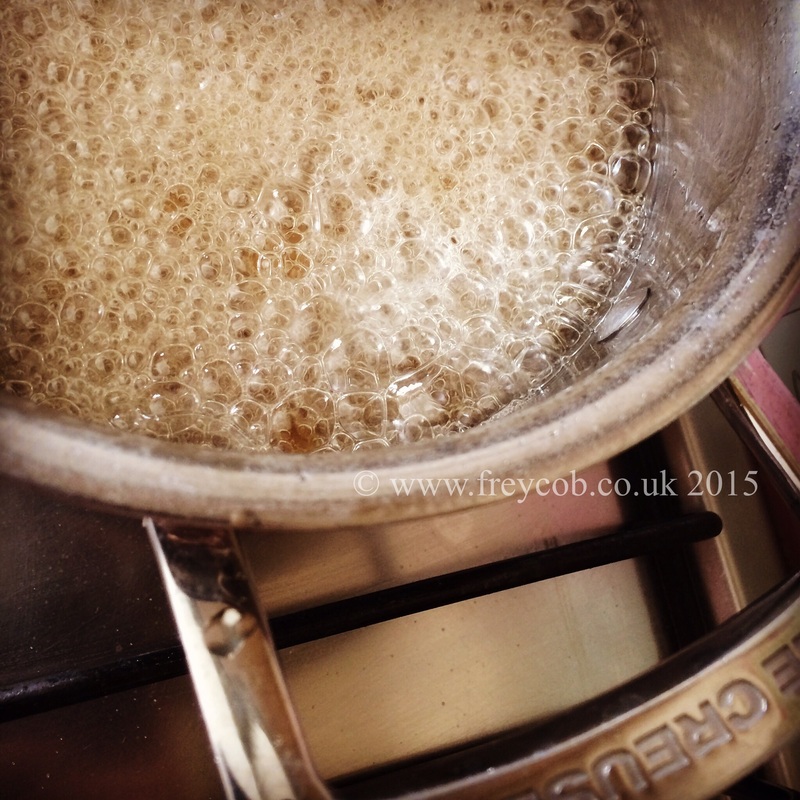 Continue to boil gently until the sugar water mix has thickened and has formed a golden coloured syrup. 10. 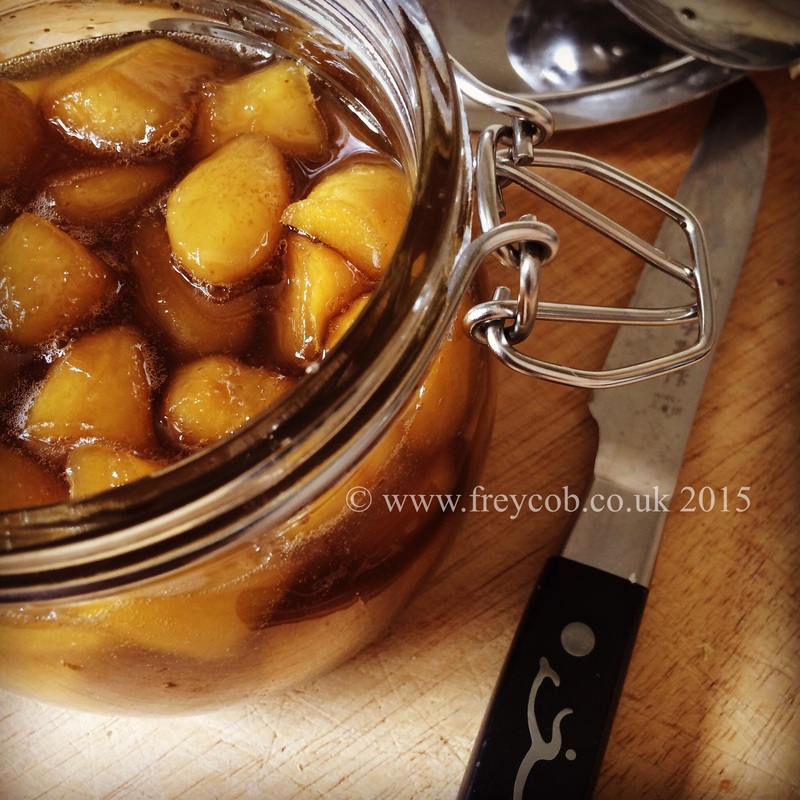 Transfer your ginger and syrup to a sterilised jar and seal. 11. Use the ginger as you would the commercially bought jars, keeping the ginger submerged under the syrup.